Check out some of our past rescues and Happy Tails from 2012! Hi, I'm writing in reguards to Chase an 11 year old pom mix that you found a place for back on April 5, 2012. He was placed with One Starfish Rehoming out of Columbus, WI.. I frequent the dog park in Columbus where I met Chase and just fell in love with him. I looked forward to seeing him and he'd follow me around the park. In November I took him home for a weekend to see how he'd fit into the family and he's been here ever since. We just love him and I got all my final adoption papers now all completed. I found your email with my papers and I wanted to just let you know that your hard work of replacing Chase has paid off and he has found a forever home with loads of love. I believe in letting you know it made a difference in this dogs life. Here is a picture from Christmas. Our kids are grown and gone and we have a big fenced in yard with a great vacation place that the entire family goes. Thanks for saving Chase cause without you he would have not found me . I believe Happy is a fit!! He fit right in with the family-- EVERYONE ! We had Christmas Eve and Christmas day with a house full and our dog and our son got a new puppy for Christmas and Happy was happy. Thank you so much for working with us. I hope your Christmas was Merry. We will keep in touch. I took in Boogie/Daisy from you after she was turned into the shelter possibly pregnant. She turned out to be the sweetest girl ever and did in fact have a litter of the cutest little puppies. I've stayed in touch with the families that adopted Daisy and her babies and I've put together a Christmas picture so they could all see how the puppies all look now. So I hope you enjoy seeing this happy ending. Daisy looks so different with her new haircut :) So cute! I'm sure you see so much sadness and I hope this brings you happiness knowing that you saved this entire family and made so many other families happy in the process. Thank you for all you do for the animals!!! Have a very Blessed Holiday Season! 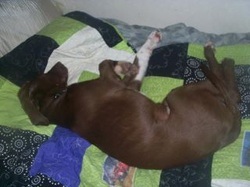 Levi, (fka Chester) in his new home!! This current picture of Levi put a big smile on my face today! Chester and Cheeto were both matted up little messes who were scared to be touched. They are both thriving in their new homes! Chester has a wonderful family with kids and Cheeto actually goes boating with his dad and doggy brothers all summer long. I am amazed and so happy for both of these little doggies! Hi Anne - I had to put Joey in a foster home - he was starting to feel too good after the heart-worm treatment. This family called me looking to adopt one if my cats, which had already been adopted. Any way they mentioned they had lost their lab earlier this year and were still heart broken & could never have another dog again. After talking to them for awhile, I really liked them, so I asked them if they could find it in their hearts to help out Joey at least through the holidays. Long story short - they said yes and he has been perfect since he got out of boarding - I am getting text after text about how wonderful he is and how much they all love him. Newly single Mom, two boys - one just graduated college - the other a 2nd year of college - both live at home, fenced yard and at least one on the boys is a runner. Joey is an excellent runner partner, stays right along your side. He tested negative two weeks ago for microfilariae!!! Hope you enjoy. ADOPTED the very next day by Father Nick! Here he is in his new home at St. Lucia's. Piper playing Candyland with her big brother ♥. love with your foster pups enough to want to keep them haha. I just happened to think of them on Sunday and took him over for a visit, they fell in love (-: He is a GREAT dog. Housebroken, loves kids, cuddly & well mannered except for being a food monger. attention? ; ) So naturally I had to take a moment to share them with her. I wanted to share these two pics with you. The first one is the first pic I received from Brian. The second pic is the one I took when I dropped her off at Peg's. If anyone ever doubts about how sensitive Boxers are to stress and upheaval, just show them these two pictures. fixin and some weight. Think she just gave everything she had to all her puppies. 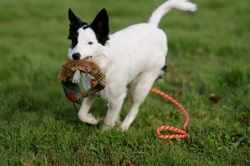 Molly the Border Collie, having a blast and doing great in her home down in FL. I just thought I would update you and let you know Crash (shelter name Drex) is officially being placed as a partial sight/seeing eye and balance service dog next Tuesday. Here is his picture with the lady he will be helping! early teens. He seemed very happy to be with them. Thought you might like to see a pic of a rescue that goes back to the last century! This chubby tortie was my foster baby at least 12 yr ago. Back in the Northlake PetSmart days. She and her brother Gershwin were found in a McDonalds bag in a shopping cart in the lot. Brought to me after the store closed by a manager, I will never forget taking them into the garage to check them out . . they were riddled w/fleas. After the fleas were treated they progressed to a 24" crate on my desk. Some babies have to learn to use litter . . these did. Every morning for days I was greeted with 2 happy faces . . and poor Gershwin with moused hair. Between walking in their moist food and other "stuff" . . they were quite a sight. One of the things I love about her is that she seems to love us all equally...doesn't prefer one to another...my kids have risen to the occasion and treat her like a teddy bear princess! Lunna was fine at the beach. At first, she was a little surprised that the waves would splash on her nose when she was taking a drink, but she soon ignored that. She LOVED watching seagulls fly by. And, of course, there were never-ending smells from other dogs that had been on the beach previously. We didn't overdo it. We would walk, then sit and take a break, then do it all again. Didn't want to make a fun day turn into too much work for her. She is a sweetheart. I love this photo. I thought you may enjoy this picture that I received last night from our veterinarian that adopted Orphan Annie. They were at their Grandma and Grandpas farm in Iowa this weekend and she was having a blast just running free with her boys. ... she's a true farm dog at heart and was loving having some freedom to run (though she'd never stray far from her family). I think she's actually smiling! Sweet BeBe came from animal control after being shot with a bebe pellet thru her shoulders. A sweet, loving "girly girl", she went home with an equally sweet young woman. It was, of course, instant love. What a wonderful ending for a cat who would otherwise have been euthanized and never been able to love or be loved. As the saying goes . . that's what this is all about. Mister is loving his new home & adjusting well! Jill came in Sunday saying she's been visiting Mister for a while. Jamie & Jill like large cats, and Mister was the fella who won their hearts. He will have a 4 mo old puppy gal pal and a couple prepared to love him. We (my husband, kids and I) adopted Daisy last Saturday from Almost Home. We LOVE her. She is the sweetest thing. I knew she came from Quincy and found your facebook page. Was her name always Daisy? Do you know anything else about her story? We call her Piper. I have a 10 year old daughter and 5 year old son. We'll take excellent care of her. Thank you for being part of her journey to us! Good evening all! Just wanted to update you on some of the wonderful Boxer babies that you have sent to us. Gump...now known as Current is adopted as of today. Sweet little Missy completed her HW treatment, went to MN a couple of weeks ago and is adopted as of today. WONDERFUL Abbey (now known as Teagan) was spayed last Wednesday...she did great and she has an interested adopter. Smoke is doing great! He is such a wonderful boy. He loves everyone and everything. He has buddied up with all of his foster brothers and mom. He loves to play and show you how much love he has to give. He has been with various people in the house including crowds and small children and just a perfect boy. He can be a real big couch potato as he loves to snuggle with anyone that is sitting on the couch and will stay there as long as you do! He has even learned all about horses and is great with them, very respectful and sweet. He will make a great addition to a family but until then we feel blessed to have Smoke in our foster home. For a starving nursing mom rescued from animal control, it's a happy ending for her . . and me. Since we called her Mama, Amber chose a name close . . thus Molly. Maureen waited for someone to see her heart and give her a chance . . simply what all animals need/deserve . . and has her person and feline companions. 8/20/12 It's a Dog's life!! These two fell into something good... and they look like it in this photo! 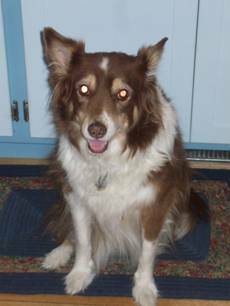 I don’t know if you remember me from 12 years ago, but you helped me get “Madeline” (from Indiana), a 3 month year old Aussie tri-color. She was abused, and possibly not adoptable, but we tried and she has been the best Aussie (and dog) I ever had. She was my mother’s constant companion (my mother lived with me) until she pasted away last year from Parkinson’s. Madeline took it as hard as we did, and still does. I just wanted you to know what a difference Aussie Rescue makes, and not only for the dogs. She (MADELINE) changed our lives in a way we never expected. Thought you guys would like an update on Boomer. He was adopted this weekend after a 3 week trial run with his new forever mom. He is doing GREAT - we've worked with him since he got here to make sure we addressed any anxiety issues (the answer usually to this problem is exercise exercise exercise plus solid routine) and he is doing fantastic. He lives with his new mom and dog brother Jake, who he goes to doggy day care with every day where they wear themselves out - they have become best friends. We are so happy we were able to save this boy and get him to the perfect forever home. Thanks for all you do! Happy endings make it all worth it. A picture of Louie. What a character! Thank you for getting this special guy into our lives. Just a quick summer update on Louie. He's a very stubborn dog and isn't crazy about the water. It's sort of non-negotiable in our home. Lucky for me that I'm stubborn and insisted on him learning how to get out of the pool should he fall in. Sure enough, Louie fell in and it took all of about 2 seconds for him to recover and off he went. He still doesn't love it but will jump in the deep end and come in on the stairs when I tell him to. Jackson is another story. I've never had a dog that treads water or stands in the shallow end on his back paws and uses the front ones to stay in place. He woud stay in the water forever. I have yet to be able to tire him out. He is the silliest guy and so full of personality. I must say though, Louie wins the personality contest hands down. He's just so sweet and that face. Both of them are inseparable and drive Sam (my 12 yr.) crazy, but isn't that their job? I'm hoping that these photos put a smile on your face. I can't imagine my life without them. They put smiles on my face every day. Just wanted to thank you all from the bottom of my heart for working together so quickly and so efficiently to get Tyson to MNBR. I am overwhelmed at what a group of caring individuals can do...even with just a moments notice. 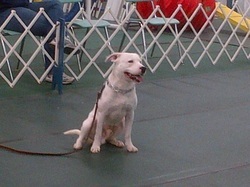 Also wanted to let you know that Tyson (now known as Windsor) will be on his way to Minnesota this weekend. Love you all! 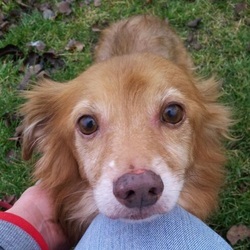 This is Bing, the dog that you sent to an adopter about a year or more ago. He’s doing GREAT as you can see and spoiled rotten!! Anyway, I thought you would like the pictures! having a blast in his foster home, waiting to be adopted by his forever home!! Want to share with all of you my happiness that our sweet, affectionate, loving, and handsome big guy Boomer has left the Building and is heading to his new forever home and family in the City of Chicago. He was adopted today by a real nice man who wants to give Boomer a wonderful home and life with his female German Shepherd Sheba. They will live in a Condominium in a very nice part of the City of Chicago. He will join Sheba going to Bark Bark Dogie Day Care less than a block away while Scott is working. 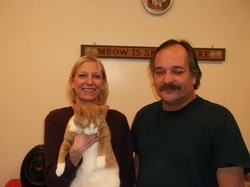 Am hoping that you will join me in wishing Scott, Sheba, and Boomer happiness and a great life. Boomer has made it to his forever home and family thanks to all of you! 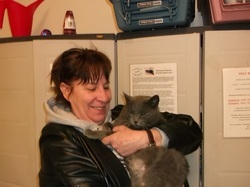 Durango in his forever home with his new mom!!!!! They are wonderful dogs and are already making themselves quite at home with the foster parents...I will keep you posted. Thank you for all of your help in getting them here - they are keepers!!! This dog is hilarious! When she isn’t sleeping on the bed (the couch, my head, or ….) she always puts her head UNDER something!! Very funny! Here is Dozer (now Bowzer) in his new home. His foster dad has decided to adopt him!!! So he will permanently be living with two Newfie siblings and is also able to go with his dad to work most days. He is doing GREAT-soooo happy. Thanks for sending this love bug our way! Beulah is living it up in the summer!!! Sat Kira stopped in to visit . . and spotted beautiful Lily. Lily was left in a crate next to the warden's truck at nite. A sweet declaw who talks, she would have been euth'd @ animal control. Kira was smitten and went home to think it over. Lily attracted many visitors. At 4:30 as we were leaving, Kira appeared w/dad. They didn't want to delay our leaving . . but, she returned b/c she wanted her and and knew she'd lose her chance if she waited. Kira worked @ WAH for several years, a family that has a history of rescue, Lily will accompany Kira to PA while she studies to be a corp attorney. A happy ending for a precious soul w/no chance. LeAnne met Kira today to release Lily . . and called to say Lily walked happily into her carrier . . anxious to get on w/her new life! 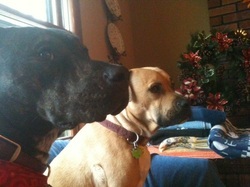 Dozer is rockin' it in his foster home--what a great dog. He's having too much fun to sit still for a photo! He is having a blast playing with his Newfie foster siblings. I wanted to send out my annual THANK YOU for all of you that were involved with the rescue of my WONDERFUL boy, Mukaday. It was 3 years ago today that we brought him up to Minnesota to become a Ripley!! We could not love him more than we do. I have attached a recent photo of him. He LOVES his plush toys! Who would have ever known this boy had so much love to give??!! Have a GREAT day, Ladies!! 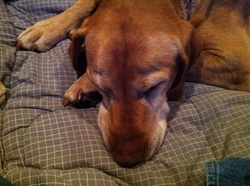 Angel the emaciated Beagle Mix went to Chicago - she is loving life already!!! Will be going through the Mcdonalds drive-thru for a burger for her SOON!!! Just to let you know he is fine. He has moved all the couch pillows to his requirements and at night he goes to the bedroom and takes my pillow and then goes back for my blanket. He then "nests" and I am finally allowed a few meters of space to recline for the evening. Another update: He is doing AWESOME!! As far as our boy; he's doing great. He had a bath this weekend, we trimmed his nails and cleaned out his ears. He continues to do well around Kassidy, and does well around the other dogs in our association. He's a fabulous dog and already such a huge part of our family! Preston is doing fantastic. He's adjusting beautifully. He's amazing with Kassidy, my 3 year old. He tries to sleep with her at night, but bossy Kassidy demands her own bed! So he sleeps with us as his last resort:) No accidents in the house yet! We are thoroughly impressed. He's getting very good at playing ball, and drops the ball without a fight. He's a happy, patient and obedient boy and we are so glad to have him! Thank you for everything - here's hoping we can work together again and multiply the happy endings. Please be sure to check out our facebook page - we've posted more pictures there and we'll keep everyone posted on his progress. 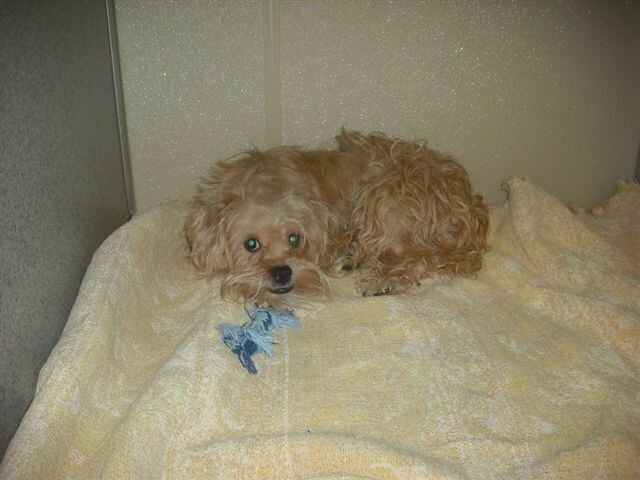 Molly, who was previously living outside all alone, was a lonely matted mess!! This friendly girl is now living it up with her human and canine buddies and couldn't be happier! Tux has been a great joy to his new home. He immediately made himself at home. He was perfect while his new family was away at work, staying in the kitchen behind a fragile room separator and not touching anything. losing out on a great dog. He asks to be out when he needs to, and once in awhile goes out just to play. He plays a lot with the tug toy his foster mom sent along with him, but he has a squeaky toy now that he can make sound like a flock of low flying geese. The daughter loves playing with him, he has a good sized back yard, and is taken on a walk at least once a day. "As I hope all can tell, we love Tux, and look forward to having him for a long time. 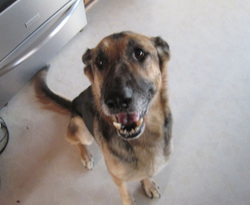 Thanks to everyone that helped take care of him and guide him to us, he has found a good home." Seamus was Jan's foster boy & Carmen was part of Toffee, Tipper & Topper (adopted together . . looked like Tippy) that I fostered. Always a curious gal. . there isn't much that Carmen doesn't know, see & do! The "t" kittens were Quincy rescues. Here is a pic that you can show to those that remember these two rascals. Bella is already sleeping in bed w/them and has a young friend. They fell in love w/Macy and got back in touch w/us when they were ready. My perfect Saturday night companion--who is tuckered out after a game of chase. Well, what she lacks in looks, she makes up for in sweetness.Mazey is a very nice little dog. Black ones are sure hard to photograph! UPDATE 5/23/12 Have a new home lined up for Mazey, the chubby chi already. She’ll go home after the holiday weekend with her new State Farm family. Mom, dad, and two girls, ages 6 & 8. Plus she’ll have a fenced in yard to run and play in. with dogs, cats and kids and settling in at her foster home nicely. We love her. This beautiful boy was a Quincy rescue that "hated" coming in for his Sat meet/greets. His foster mom introduced him to her friend . . . and, as they say, the rest is history. As you can see from the pic, he's a happy much loved boy. I love this shot as he's so silly and loves to show off his belly! He's very happy here as he's the man of the house. This pretty fella was dumped in a holding cage with other kittens outside Quincy county animal control. Lucky fella is now much loved. Jaxon, who was 4 years old in April, is the kitty the kids adopted from us. BooBoo aka The Great Yogini... This fella came up w/his mom and siblings . . a tiny baby w/a stub tail. Grown, he had legs like a jack rabbit . . the most wonderful guy . . now lives w/2 brothers also rescued from Quincy. I had to share this photo of BooBoo doing his best yoga pose. He actually sleeps like this quite often. The boys are doing great! They are both so cuddly and love to chase each other! We have taken them on several road trips and they are very well behaved in the car. Our beautiful Tommy and his new best friend. It took a while, but now they're buds! The boys are friends. Tommy on the bottom here ( not always the case!). This is from one of their cleaning sessions. The little black one in the back is from you! The yellow one is from the breeder that Sue/I helped stop. Aren’t they darling? 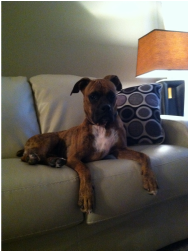 Anne, here is a picture of Chase, having made himself at home on the end of the couch at his foster mom's home. 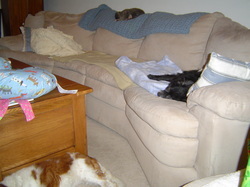 One of her other dogs (a puppy mill rescue dog) is in the foreground sleeping on the carpet, and one of the foster mom's old cats is sleeping on the back of the sofa. Kinda cute, huh? Time for a Spring update. Beulah with Fredericka in her "Feaster" bonnet! As you can see by the photos, Beulah is thriving and adored by all of us. Our pond has dried up but hopefully with rain it will again return to provide joy and exercise for Beulah and Andy.We had no idea she would become a therapy dog so soon...but a month ago we found out my sister (and best friend) has pancreatic cancer. My mother died of the same at age 52. This has been devastating news and Beulah has played an important role in keeping me grounded. She truly is a therapy dog...she is so very precious, smart and totally adorable. She has bonded to both Bonita and me and gets along so well with Andy and Rover. She gets braver every day and today she enjoyed almost playing with a puppy at the dog park. When I went to visit my sister in Rhode Island for a week, Beulah slept on my pillow every night which she had never done. She always sleeps in her crate at the foot of the bed. When I got home I was a bit worried she would not readily give up her place in the bed but I need not have worried. She went right back to her habit of sleeping in her crate. In the morning she joins us for coffee in bed.We are so very glad we have Beulah at this most difficult time in our lives. Here is a picture of our Trix (Trixie). She just had her 3rd birthday! Kevin and his girlfriend spoil her rotten! She is VERY loved and is living a very good life. Just thought you would like to see what she looks like all grown up. He got her from you when she was not quite a year old yet. Thanks Anne and Jenny! I LOVE her too, of course! He’s doing everything right by her, taking her to classes, exercising her, socializing her, etc. She is very loved. She got a doggie donut for her birthday and wasn’t sure if it was something she was supposed to have, but she finally ate it and liked it. Thanks again for getting her into our lives! Neo is the big guy Ernie took when he was deemed too difficult to readopt (given to animal control instead of back to us). Shy, black & big, Sandi stopped bringing him in on her rotation. Ernie took him b/c he deserved a loving home. He's learning to blend in w/the other cats. The orange is Jack . . who came up w/Rufus the 3 legged cat several years ago. 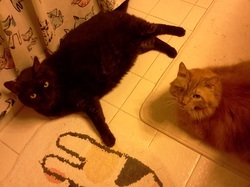 Ernie & Jim fostered both of them and he said unless they went together he wouldn't part w/them. Obviously, there wasn't a long line waiting for two boys displaying the ravages of our society. 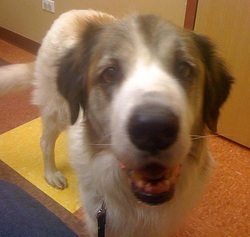 Rufus was loved until his mouth cancer got the best of him. This is a Quincy flood cat. Hated coming out for adoptions. Wouldn't go into the room. He's a buster w/the other cats but adores Ernie & Jim. As you can see by the pic, they are happy cats! Burly (right) is doing "wooftastic" in his forever home and continues to impress me each day with his training and loving personality. This nice couple were looking for a companion for their young girl and our sweet Marek was just the fella. As his card said, he is Belle's boy from her 2nd litter. She came from Quincy w/Bob, Bobbie & Bette and we later found out she was pregnant when she came up . . and gifted Marel w/Marek, Mila & Macy. Sammy was transported to safety just in time to give birth to 8 puppies! We didn't think she was so close to delivering when she was transported. Little Lydia came unannounced on the Quincy transport when we received Greya & Brenda. I knew I was getting two . . and a third carrier appeared w/her precious little face looking up at me. Later learned she had come into animal control late Fri . . no body remembers if she was a give up or abandoned. I have to believe she was a relinquished pet. The transport coordinator said "send the cats" not knowing Lydia was there . . so luckily she came too! A joy to foster, it was very difficult leaving her Sat; but, I knew she'd be going home the next day w/Janet & Maria and wouldn't have to be there long. Lucky Lydia has a loving home. Dominic is doing great. He seems very happy and content. He has met 3 other family members and he seemed to approve of them. More importantly he met the dog - Lu - the 8 year old Golden Retriever. The 2 got along great. Dominic treated her as if he had grown up with her all along. He also met the cat who went to college but is back home on spring break - there is respect at a distance thus far for them both. I couldn't find him one day. I panicked and looked everywhere. Pat found him asleep in Pat's empty gym bag. We're loving our new furry friend. It feels like he has always been there. Have a good spring. Both Greya and I are doing well. She's checking out everything in the house and seems to be very relaxed and comfortable. She and I have been watching TV together; she's even sat on my dad's lap for awhile. He's impressed. I need to take some photos with my camera so I can send over on the computer. I posted her picture on my facebook page and all my friends are in love :-) Thank you both so very much for making this possible. I have made an appointment for Friday with my Vet. I told them about her sniffles. They of course are very happy for me too. She had a very good night and slept by my side. I love that she readily jumps on my lap and gives head butts. She is making herself at home. Ginger (now Penny) has been enjoying our apartment. She likes sleeping in our bed at night, and likes playing with ribbons, stings, and balls under our bed. She has met our other cat, Rocky, and they get along pretty well...a few fights though! She enjoys eating dinner with us, and we now have her on adult cat food. We give her a little bit of wet food after we found her eating our other cat's. She still likes to be held, especially when we come home from work. She likes cuddling up with us on our necks, she's our little scarf! We hope you enjoy the pictures! Thank you so much for helping us find our perfect pal. We are TOTALLY SMITTEN with Beulah whom we have named Beulah May Velcro. May is to add a Southern touch to her name and to remind her she MAY stay with us forever. Her last name is Velcro and that probably does not need explanation. She has “Velcroed” herself to me yet continues to branch out each day. I will be gone to visit my sister for 4 days so she and Bonita will be home alone! I know they will do fine. To celebrate Beulah’s one month anniversary we took her to get her teeth cleaned! We had been to the vet several times to desensitize her. One of the times they were talking about the fact that dogs hate to get on the scale. And as if on cue, Beulah started to run back and forth on the scale. It was quite hilarious. For her teeth cleaning I was allowed to stay with her when she received the first sedation and then I returned just as she was waking up. She is a “special needs” pup when it comes to anxiety and shyness so we were happy we could be with her. Despite Beulah’s shyness we find her to be INCREDIBLY RESILIENT!!!!!! She is such a joy to watch her come into her own. Everyday we see improvements. Today she played with us at the neighbors…2 other dogs each over 120 lbs and 3 men! She is learning so much…a very smart dog and a quick start! She has an incredible “joie de vivre”. She is learning to heel whenever she is walking on the road with me. We are also teaching her to sit at the end of the driveway whenever we walk down. We are using clicker training which is so much fun for her and us. We have decided not to take her to classes yet as she is too fearful but she is an incredible learner. We do take her to the pet stores and the dog park on occasion. She, Andy, kitty Rover and the chickens are all getting along beautifully. We cannot express how well things are going and how happy we all are. She is a real gift in our lives. We thank you both for the care you provided her while she was waiting for us. Thank you so much for the sweet email. It is interesting how things work, isn't it? We've been hiding from the kids the fact that we've been looking at adopting a cat for over a month or so. Not sure how we pulled that one off but it apparently worked. Andrew and Madelyn are very excited about Truffles but the main reason we thought about adoption was for Kelly and I. We both absolutely adore 'all' animals and are looking forward to all that Truffles has to offer. The love, support and care that we have for Truffles will be showered upon her immediately and for many years to come. We have already been making a few purchases for Truffles and are looking forward to her arrival. With my carpentry skills and Andrew's imagination, he has already designed a custom 'cat tower' complete with a ramp, swinging tennis ball, climbing post and of course a nice cozy area in the middle for Truffles to take long naps in the sun. As excited as we are about our trip to Mexico, Kelly and I are even more excited about picking up Truffles upon our return. 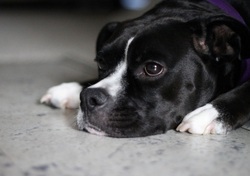 We're so happy for Roxie - she is a GREAT dog and it's been our pleasure to help her on her journey. 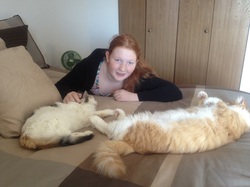 Manny, Flower and Tommy: three Quincy cats who are doing great in their furever homes! I just wanted to touch base with you regarding Haas, the dog I was "supposed" to foster last February. Hallie and Sue promised me they'd find a home for him in 3 weeks time. You rescued him from Quincy. I'd never had a small dog and at 40 lbs., well, to me that's little. I didn't think he'd be able to keep up when I run with my dogs and I didn't know anything about dogs under 85 lbs. Silly me. Louie is a dynamo that's filled out nicely at 62 lbs. of solid muscle and gleaming coat and has absolutely no clue that he's not the same size as my other 2. Sue Horn met the transport in Plainfield and drove him to me. One look and I was done. He is now named Louie after the Dan Akroyd character in Trading Places because nobody wanted him either. Louie is the sweetest, most lovable dog and I must say between my neice and her husband and whoever else meets Louie, they all want to take him home. When he talks to my other guys you can't help but crack up. He sounds exactly like Chewbaca in Star Wars. Louie is doing great, loves being outside and as my "fostering" is coming to 1 year at the end of the month I wanted to share a couple of photos of him with you. The yellow lab in the photo is Jackson who also was from Sue and Hallie and he will be with us 2 years in June. Thank you for getting this special guy into our lives. Thanks again for our new family member, Jerid. It's been about a month, and now he is officially friends with his new brother, Thor. They play and cuddle together on "the cheese wheel" - the piece of furniture in the photos. Jerid is always waiting for us to come home, and crawling into bed with us at night. He has really come out of his shell and is super-playful! What a wonderful happy ending for a super cat that just "appeared" in an animal control cage! Thanks to Jen for calling immediately and giving him the chance to hitch a ride the next day on the rescue transport! We met Ginger when we went to Quincy to see the animal controls and meet the warden that works with us. She was relinquished with Dominic. Outgoing, she would have easily found a rescue. Dominic, however stayed to the back of the cage shy and confused. The next day, he came forward to me and licked my hand. I could not let him be separated from her and left behind . . he deserved his chance. Since we were returning with Manny, Dottie and Mama Maureen and her 3 tiny babies, we didn't have room for two more. As it was, we purchased two additional carriers to bring back the unexpected rescues. Ginger and Dominic waited the five days and came up on the next transport. A happy gal, she played well with all of my fosters and charmed everyone who saw her Saturday with her standing on her head. Though accustomed to nites in her cage, the adoption center was another matter. Upset, she would climb the bars and beg to get out. Many people were smitten by her, several talked about adopting her; but, only Jennifer and Jacob were sincerely wanting to add another cat as a "forever" companion. They had returned to West Sub where they adopted their fella, and had been visiting us several Sundays . . this Sunday was the day and Ginger was the cat. Now both of the relinquished cats have loving homes . . timing is everything. Beautiful Belle came up on the Quincy transport w/her 3 kittens . . Bette, Bob & Bobbi. Unknown to us she was pregnant . . so she has 3 kittens still in foster. A dignified lady, Belle has blossomed and will bloom in the loving care of these three women. Leslie has been looking at Belle since their older female passed. Pam sent a pic of Leslie with Belle for mom to see. That began the happy meet/greet . . and the forever home. Belle's journey has been long and rather hard . . she deserves to be pampered . . and she will be! Dottie is doing very well. She is fitting into our family nicely. Our other two cats have generally excepted her. Everyone gets along and occasionally they even cuddle a little. For only a month in I would say everyone is getting along excellently. Dottie loves to sleep with us at night too with her new brother and sister on the bed. She usually sleeps on me or right between my wife and I. Her favorite toy is Da Bird followed by her mouse toy. She will bat those mice all over the house. It is also very cute when the mice get a little to far away for her liking she will grab it in her mouth and run across the room jumping on the couch to play in a different area. Dottie also loves the cat trees that we have. She loves to use the scratching posts and get high up to look out the windows at the birds and other critters outside. My wife and I are extremely happy to have adopted her and give her a forever home. We are also grateful to be able to have adopted her from CAR as it opens a new space for another kitty in need of a home and I can tell all the cats get treated very well at CAR. Mike came in for beta food and spotted our handsome fella. Determined to do a meet/greet, he came in w/son Patrick. Once they met him, they knew Dominic was the guy for them. A Navy dentist who misses having pets around, Dominic will be the perfect companion. And, when family members visit, Dominic will be fine w/a mature golden and another cat. A family that has always had pets, Dominic will fit is just fine. Dominic is another Quincy rescue. We met him when we went down there to personally visit the Warden and see the city/county animal control facilities. 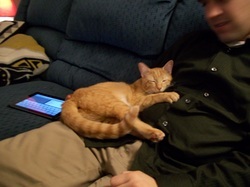 He had a young companion . . Ginger an orange tabby who will come out this weekend. Knowing she would be "rescued" quickly and concerned for quiet Dominic that he would be overlooked, we told them to send him up on the next transport since we were full w/the ones we were bringing back. For Dominic and me, it was love at first sight. Afraid in the back of the cage when I first saw him, the next day he came forward to touch my extended hand . . he had to be saved. A happy ending for another needy relinquished pet. New name . . new life. Paula and Scott where looking for a companion cat, and were instantly smitten with him. They had an appointment to see another cat; but, as destiny dictated, the other cat wasn't our Manny ... and they came back for him. I spoke w/Paula before they came in to finalize the adoption . . and she said they were both excited . . like adopting a child. A great cat, Manny will do fine w/their cat and small dog. For Manny and the saved dogs Pepper & Duke . . they have happy futures thanks to the dedication of Jen the warden. Just a few new pictures of Beulah from her happy new momma's. She looks so happy! Just thought I'd give you an update on Daisy and the puppies. 5 of the puppies have found great homes and I'm down to Daisy and one puppy Maisy. That was a LOT of work cleaning up after all those puppies so having just two is a breeze!! LOL! I think the puppy that's left is the cutest one in my opinion. They were all ridiculously cute but Maisy has the sweetest face and cute markings and she's so sweet. She gets lots of oohs and aahs when I take her places but she doesn't let it go to her head. They are all spayed/neutered and two of the puppies and Daisy had a hernia so those were also fixed and I had them microchipped as well. Daisy is a perfect dog, my first rescue without some issue, and I'm going to make sure she gets a perfect home. Here are pics from their trip to the groomer today. It was a lot of excitement for Maisy and she conked out at the end. Thanks so much for saving her/them! Oscar the Underdog, relaxing in front of the fireplace! Just a note to let you know that yesterday Beulah was adopted by the perfect family! Needless to say, given Beulah's sad story and her sensitive nature, I was VERY careful to place her with just the right adopters. PS: Thank you so much for the role YOU played in saving Beulah. 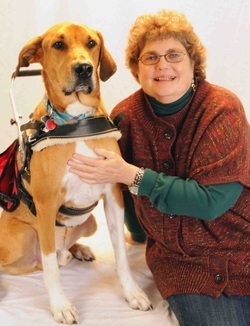 It's a true pleasure, working with you--and hope we can continue to help some of your dogs in the future. Betsy was a tiny little baby when she made the long journey up w/other Quincy animal control rescues (Belle and her kittens, Tyler, Scott & Shelby and Deidra) . . a lot to take on all at once! I told them to send Betsy w/o knowing gender, color . . it didn't matter. They said the tiny kitten would not live there . . supposedly sickly, it would have been euthanized. I will always remember this tiny soul coming out of the carrier I transferred her to . . purring and head butting LeAnne. All she needed was love and good food. She got lots of both . . and grew into a beautiful loving girl. These ladies will have a wonderful companion. We are so excited to have Dottie join our family. We took her to our vet and she got a clean bill of health (not that we were worried since she seemed much healthier than our last adoption). She has adjusted effortlessly to our house. Loves to play with our flying bird toy and burly mouse. She is also showing off her climbing skills on the cat tower. She purrs constantly and seems to enjoy our company. Our resident cats are adjusting better than expected. We still have them separated the majority of the time, but are starting supervised visits where we are all in the living room. They have gone quite well. Dottie is such a laid back and loving girl she just ignores our other cats--which is great so they don't feel threatened and can just get used to her presence. Thank you again for the opportunity to expand our family. We are so grateful that she has come into our lives! I have the best cats in the world! Attached is a the photo of BooBoo snuggled on my lap. I've also attached a photo of Abercrombie coping with winter his own way - nothing like a warm heat register on a cold night! I get the cutest photos of Aber and BooBoo, as they're total hams. Abercrombie's weird way of sitting and his penchant for sprawling on his back like roadkill make him a great photo subject. Fitch is a little tougher, as he is constantly on the move, my little athlete of a cat. I do have a great shot of him snuggled with Abercrombie, his brother's "arm" thrown protectively around him. I'll send that one to you if I can find it in my files. Just thought you may like to see how our boy cleaned up. He is stunning isnt he? He has been out and playing in the snow here today as we had gotten about 6" over night. He would much rather just be with his people than play but, he managed to get in a couple laps around the yard. Please forward these onto his foster Mom for me. Tell her that he is awesome and is doing so well. UPDATE 1/26/12: Sailor has been renamed Dublin by his new owners and he lives in a beautiful home in the city with a big fenced in yard. Dad and Mom both work from home so he gets lots and lots of attention. He shares their bed with his new best friend and cat brother named "Fender". There are many close relatives with children and other dogs in the area for him to play with. There will be a brand new baby brother or sister of his very own to love at some point very soon. He will be in absolute heaven as he know has everything in his life that we had hoped for. It took absolutely everything that I had in me to let him go. Our other resident cat loves to hang out in our enclosed back hall (I think there might be mice under the landing and he loves to listen) so we let him go out there for a bit. In the meantime it gave us a great time for Tommy to get out and explore the house without Dexter following him. He has been quite the little explorer too. He is not a hider at all. He has been in every window; so cute the first time he stretched his very long, lean body up to the sill to look out (even though there was a cat perch on the sill that he could have sat on). He has also explored the basement, which is good because that is where his litter pan will go once he and Dexter are together. He is not afraid of the cat door either; that kind of surprised me as our past kitties have had to be coaxed through it the first few times. He just walked right through like it was nothing. We were happy to see he is not afraid of stairs (not knowing his past) either. I've attached a couple of pictures. Don't worry, this cat will be photographed A LOT! I will send some of the two of them once it gets to that point in their little kitty lives. A wonderful guy . . he walked out of the carrier and greeted us all. A joy to foster, and difficult to leave on Saturday, I was delighted when Pam called to say he'd been adopted to a super couple who had a Forest Cat so were well aware of the care needed with a long hair. 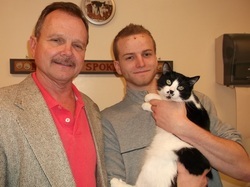 A happy ending for another great cat that made the long journey to us! 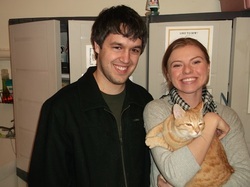 Two Quincy kitties, Bette & Shelby with their happy new family! Reggie with his new family! Gabby, the yellow lab pup, has been adopted!! I just wanted to update you and let you know that miss Sadie went to a foster-to-adopt about a week ago and this weekend she is officially being adopted! Sadie is being adopted by a very active senior woman so they will be one heck of a pair; two spry seniors ;) Thanks for all your help in getting this sweet girl to safety! She really is a great girl and we're so happy to have gotten to know her. Her heart sounded fine once treated for worms and she was able to safely be spayed. She did recently have to go to the vet for a double ear infection so the picture I attached is from her vet visit; despite the ear discomfort she was still smiling! She had recently been groomed and is enjoying her clean short cut ;) Thanks again for all your help with coordinating and advocating for miss Sadie. Thank you and Andrea for saving Dutch. We adopted Dutch immediately after we were called. We had just lost or great rott Ceasar to cancer. Dutch is a great dog, so loving and gets along with our beagle and two cats . He really loves kids. He seems to be missing them. We have a daughter who he often sleeps with. Thanks again. Happy New Year!!! Hi Anne~ Not sure is you remember me but my family fostered and adopted Davidson now named Huey. He came from Quincy Animal Shelter in June 2010. We decided to DNA test him just for fun. Below is an email I sent out to several friends. I didn't include you in that email because I wasn't sure if you'd remember us or him without a little of this info first. If you want to guess his breed/s or just curious what his make up is let me know. Ray decided to get Huey DNA tested as a Christmas gift to me since I couldn't figure out what I wanted. I enjoyed finding out the results of Otis' test and tests of some friends so I thought Huey would be an interesting one to do. I believe personality is just as important as looks in determining a breed....So here we go: Huey is 2 years old and has food & seasonal allergies. He came to us at 9 months old with hip dysplasia which was fixed with FHO surgery in December 2010. Since he's recovered from the surgery he is a fetching maniac, to the point of being irritating. lol He has a huge under bite with crooked teeth, droopy lower eye lids and droopy jowls but he's not a drooler (thank goodness!). He has a tendency to persistently bark at Otis if he wants what Otis has until Otis gives it up or I step in. Other than that he's the sweetest dog I've ever met. His current weight is 85lbs which is good for his height, he looks great! Huey is always 'mothering' the pups I've fostered and gets along great with our cats. Oh yeah he thinks he's a lap dog. 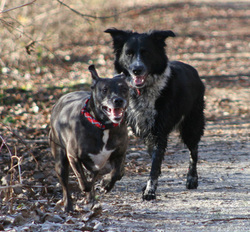 Scout and Kisha – Adopted about a year apart from Quincy, and best friends. I think they're both ready for us to all be back at school and work - they're just exhausted after having us all home for over a week!